For years, I feel like we've been chasing a holiday brass ring, so to speak: a great family activity that you don't have to get out of the car to do! 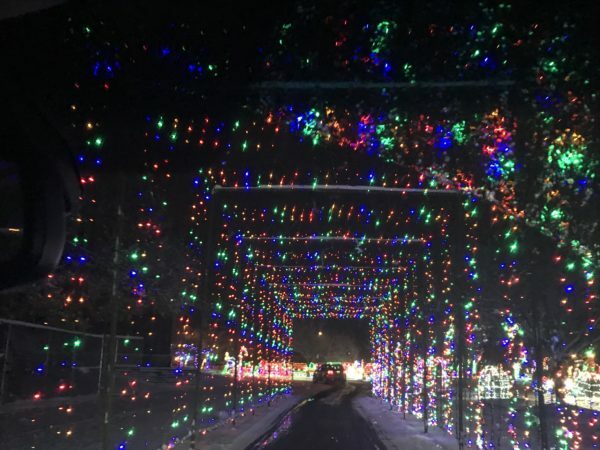 I found it: Skylands Stadium's Christmas Light Show in Augusta NJ. It's about a 45 minute drive from madison, and it is well worth the trip. I took my family -- two adults and four teenagers -- last saturday, and we had a great time. We actually did get our of the car, and we saw so many family groups having a ball. It seems like the perfect festive activity for truly all ages. If you have little ones in carseats, this is for you. Older relatives who maybe don't want to do a lot of walking: perfect fit. But what if you have some of those out of diapers but not yet attached to their phones types? The ones who are not, as you are, fooled into sleepiness by a 4:30 start to the dark, dark evening? Pop them into the car, they are going to love it. 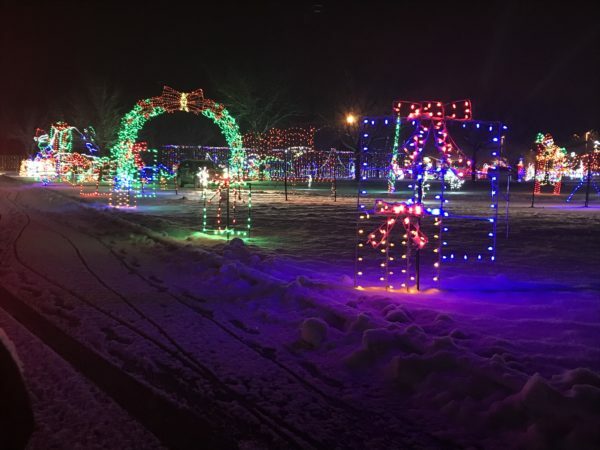 That's because in addition to the spectacular drive through light show, Skylands has a winter Christmas Village you can visit! They have a fire pit and S'mores kits. They have a weather proof out door (but covered) iceless skating rink and skate rentals are included if you choose to buy some "ice time." There is an indoor market with gifts for sale, crafts to do and some charming animatronic reindeer who I think are singing along with (or maybe providing?!) the holiday tunes. There's a basic snack bar here, but if you want to make an evening of it with a table service restaurant dinner, you can do that too. The Wheelhouse Craft Kitchen + Bar has excellent food -- we were partial too their subtly seasoned sriracha popcorn, which was served instead of a bread basket. 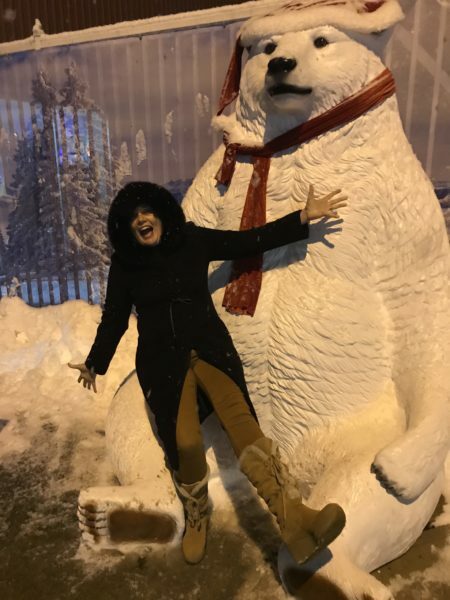 Really, you had me at "S'more Bar,"but I was able to tear myself away to pose with the charming polar bear statue. We ate at the Wheelhouse first (reservations are recommended if you go that route) so we did the christmas village and s'mores (and then more s'mores) first. Then we headed out to the light show. It is a dazzling display of every kind of holiday image you can imagine. Here are a few highlights. It was a very cheery evening for our family and left us in the holiday spirit. The lights start at 4:30, so if you wanted to enjoy the charming nearby town of Lafayette, head out after lunch to catch some daytime hours in the country. The Christmas Light Show is open daily tomorrow (Dec.14) through December 30. Find more information here.